Dealing with hard cash comes with great risks. There are high chances that in a while if not often, crooks will trick you with counterfeit notes. With this threat being everywhere, having a fake notes detector will save your business or organization from losses. Although sometimes its easy to detect fake notes with just eye examination, today criminals are capable of reproducing real like notes which are hard to detect. A detecting machine will always eliminate doubts since it can easily single out counterfeit money, hence enabling you to be 100 percent sure about your received cash. Currency normally has many security features which make it hard for criminals to perfectly reproduce. It is these features counterfeit checker utilize to know whether the note is fake or legit. Amazingly, depending on the size of your organization, these machines are available in different sizes. Some are small while others are large and high-tech. In fact, some are compact, which enables them to be portable and can be used on various occasions. Detection technology also varies from one brand to the other. Some use UV light, infrared and other magnetic technology. Now, Depending on where you are based, it’s important to check whether the machine is compatible with your currency. There is no point of buying a detector only to find it’s not compatible with your intended bills. But, with improved technology, some machines are designed to handle more than one currency. Learning the detection technology used by machine is a vital step as it will enable an easy process. To eliminate risks involved when dealing with cash, here is a selection of top 10 best counterfeit bill detectors in 2019. 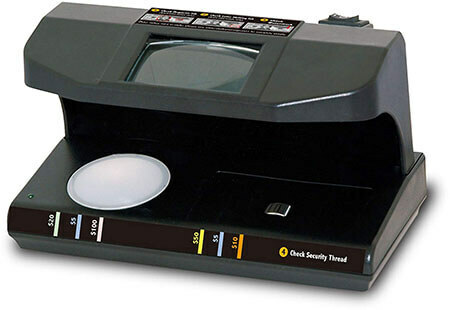 The Tri Test Model is a unique portable countertop counterfeit detection device built with the latest LED technology. There are 3 tests that authenticate money in a few seconds while providing maximum protection against counterfeit. The UV light helps reveal the security thread while the backlight reveals the watermark portrait. 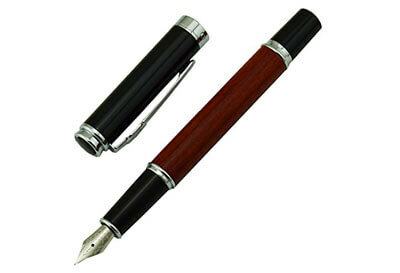 There is a counterfeit detector pen that authenticates the paper of the currency. This unit operates on 3 C batteries or an AC adapter. The best part about this portable unit is that it is compact and takes little space. 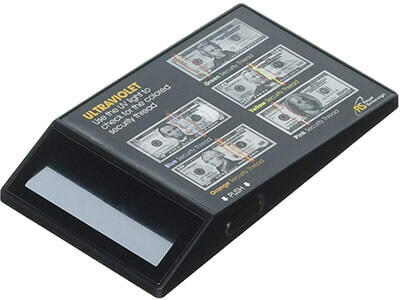 Stay protected against counterfeit currency and false documents with this best counterfeit detector. It also helps authenticate passports, credit cards and drivers’ licenses among other important documents. While not being as portable as the Tri Test model, this 4-way counterfeit bill detector still protects your business from counterfeit cash and documents. It boasts multi-level counterfeit detection. There is a magnifying glass that helps find micro-printing on bills and a magnetic sensor that checks traces of iron in currency. Along with these unique features is the UV detection that helps reveal hidden security threads and holographic images on IDs. The Royal Sovereign unit also ranks as the best counterfeit bill detector because it also has a fluorescent light that makes it easy to view hard-to-see watermarks. 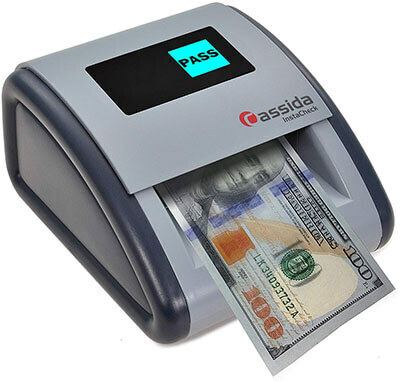 With this 4-way machine, you can rest easy knowing that you’re your business is fully protected against counterfeiters. Just as other units from this brand, the RCD-3PLUS also comes with a US security chart guide that helps if a US bill is authentic or not. Making it on this list is the InstaCheck automatic counterfeit detector with infrared technology. Its procedure is quite simple but very unique. This machine will give you quick conclusive results in less than a second. The only result you should expect to see on the simple LED screen is either a pass or a fail; nothing more nothing less. 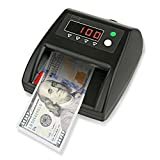 This unit offers advanced counterfeit detection by scanning money and cross-referencing a comprehensive database to confirm its authenticity. It is compact and quite portable that you can always fit and use it anywhere. Besides, it is also battery operated. 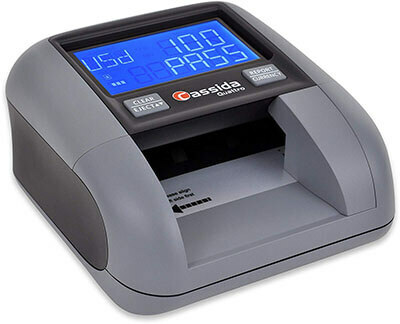 The Cassida unit is an all-orientation automatic machine that ranks as the best counterfeit detector within this price range. This should come as no surprise though; the machine allows four possible orientations when other models on the market allow only one. Besides, the Quattro counterfeit money detector has a simple easy-to-use design that makes it a most preferred unit among many people. The large blue high-resolution LCD screen gives you clear and immediate feedback when the bill passes or fails. 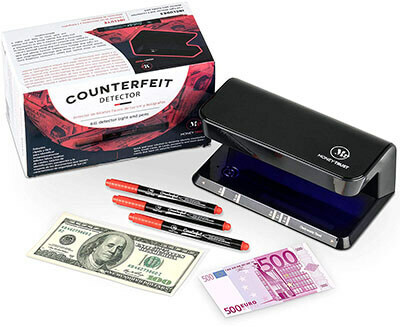 This pack of 12 money markers is the most cost-effective way for retail businesses that want to protect themselves from counterfeiters. 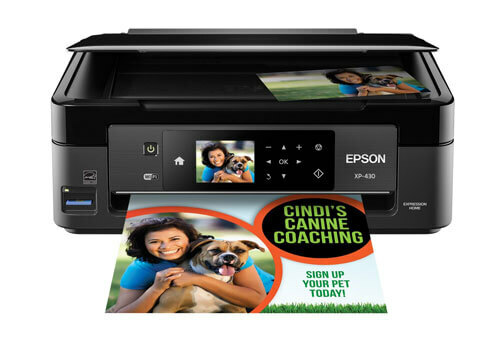 It uses special ink that automatically activates when placed on bills. Black means counterfeit while gold means genuine; the process is that quick and simple. 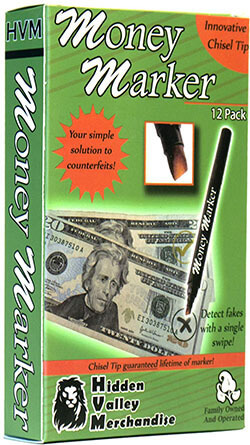 The counterfeit bill detector pen has an innovative chisel tip that prevents it from drying out. It helps detect fake US dollars, Euros, Pesos and other paper currencies. For the budget-conscious retail business owner, this is truly a great investment. Selling at a pretty fair price, the UV Pro Plus uses the most advanced UV light available to make it easy to detect counterfeit money and fake documents. The counterfeit bill detector is compact and very powerful. 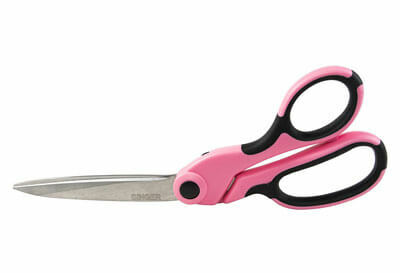 It fits into your cash register or pocket for easy access. 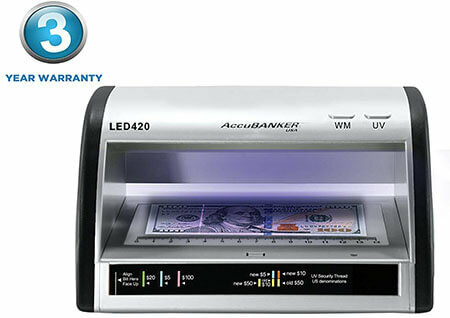 It is equally easy to use; all you have to do is shine the LED light onto the currency to reveal the glowing security strip. The UV Pro Plus operates on 3 AAA batteries that come in the package. This new model is great for large retail stores, banks, restaurants or anything in between. It is designed with the latest and most advanced LED technology and white LEDs. This unit is quite compact and pretty easy to use. 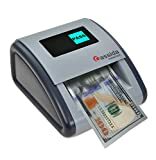 It uses three detection methods – watermark, ultraviolet, and size detection – to protect you and your business against counterfeit currency. You can use this powerful unit to analyze and verify security features on bills, passports, credit cards and other important documents like driver’s licenses. Unlike other models on the market, this counterfeit bill detector allows you the convenience of not replacing bulbs frequently. The compact unit consumes little power, has an auto on/off sensor and comes with an integrated ruler to check bill dimension. Thanks to the technology behind this unit, you can easily detect fake bills and document within a few seconds. You can carry it anywhere because this machine is small enough to fit in the pocket. It uses ultraviolet light to easily detect security thread on currency and holographic images on IDs. This process is quick and simple. It is easy to use the machine plus there is a bill detection guide included for convenience. When it comes to performance, this detector truly delivers the best results. It is battery operated and can be used to verify currency, credit cards, IDs, and passports. 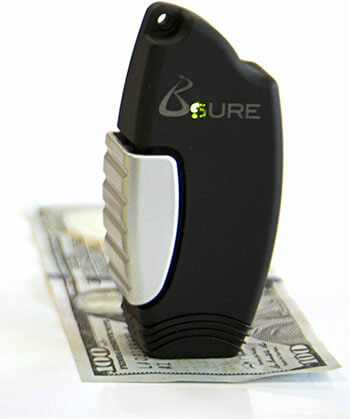 This pocket-size counterfeit money detector is perfect for any small business or restaurant. It is more effective than a counterfeit bill detector pen thanks to the advanced technology behind this model. Furthermore, after comparing to other products within this price range, this machine ranks as the best counterfeit bill detector this year. It uses optoelectronics technology to provide you with the best counterfeit detector ever seen on the market. Besides, it is quick and super easy to use. 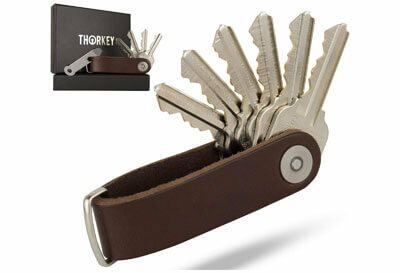 Its portable size allows you to carry it easily in your pocket or bag. 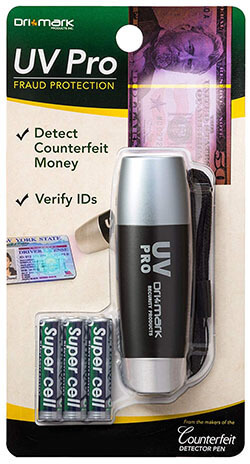 This detector system also comes with 3 counterfeit detector pens to help you detect counterfeit bills and verify important documents with UV light security features. The unit uses a two-step counterfeit detection process to give you the best and most reliable results. The process is equally quick and easy you don’t have to worry about understanding the technicalities behind the unit. 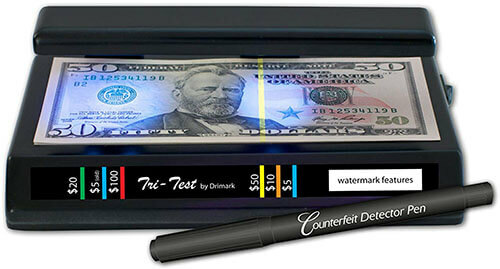 The pen has special ink formula that helps you detect counterfeit bills with just a single mark. It’s easy to bring it along wherever you go because it is small and quite portable.